Tópico em 'Animes sem data de estréia' criado por rapier em 19/10/2018, 11:00. Sinopse AniDB: * Based on a light novel series written by Yamaguchi Satoru and illustrated by Hidaka Nami. After hitting her head particularly hard one day, Duke Claes' daughter, Katarina, suddenly recalls all the memories of her past life: that of a teenage Japanese girl. Just before her untimely death, this girl recalls playing an otome game... that is exactly like the world she's living in now! 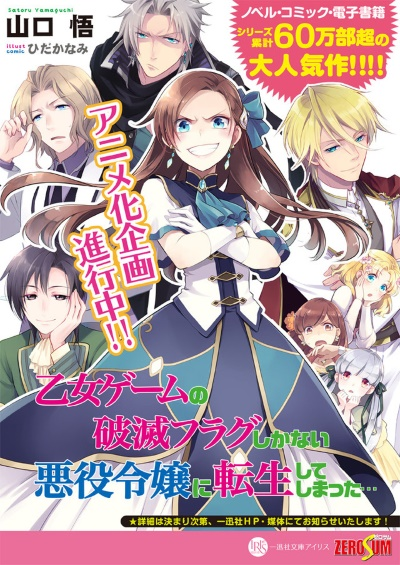 She is now Katarina Claes, the antagonist of the otome game, who nastily hounded the protagonist until the end. Knowing all the possible outcomes of the game, she realizes that every single possible route ends with Katarina being murdered or exiled! In order to avoid these Catastrophic Bad Ends, she has to use her knowledge of the game and her own wiles, starting with breaking off this engagement with the prince... Will Katarina survive while making her way through this world, where bad flags trip at every turn? Find out in this reverse-harem rom-com, led by everybody's favorite villainess! Isso daqui é tensei josei de harém reverso. Não costumo abrir tópicos pra animes harém reverso, mas como esse é "renasci em um mundo de jogo", vai que alguém assista. Cara, até que achei essa sinopse engraçada, então vou dar uma olhada com certeza. Só isso já deve ser um ponto positivo. Espero que seja devidamente engraçado, porque a situação na sinopse foi. Já li um mangá assim, depois pesquiso o título pra você. Nossa, lendo o nome em inglês desse anime agora, eu já passei o olho pela novel disso. Não reconheci o nome japa. Pior que nem lembro se era tão engraçado quanto a sinopse faz parecer..
Isso ja ta no repertório de isekai/tensei. Ja tem várias novels com essa sinopse e adiciona renascer em livros/LNs.